Do you want your robot speak up? Or did your plants ever mentioned they are thirsty? The Speech Synthesis Shield for Arduino makes it easy come true. It is time to give a voice to your robots and projects. 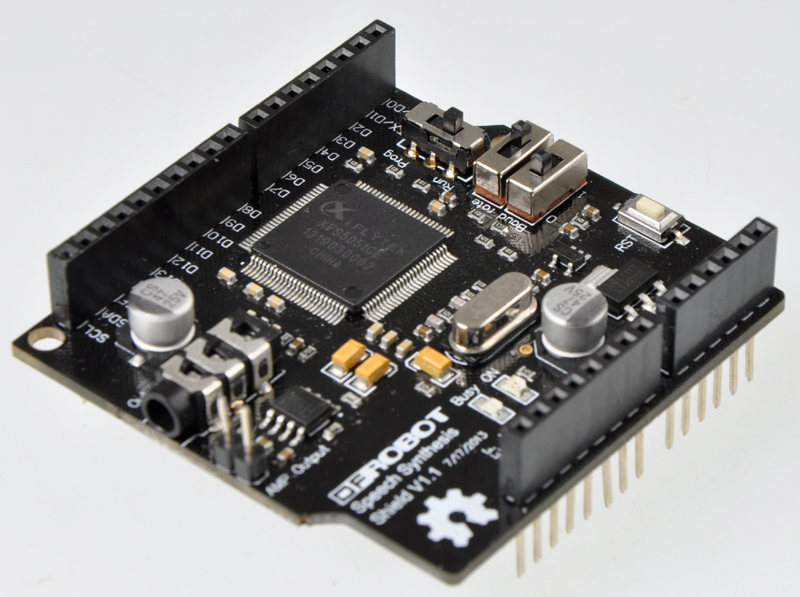 The Speech Synthesis Shield is designed to be easily stacked upon any standard Arduinos. It uses a XFS5051CE speech synthesis chip from IFLYTEK which combines world leading technology and high degree of integration. Languages such as Chinese and English are both supported, dialects such as Cantonese and mixed speech are also functional with this module. It is very funny to make a weather forecast with broadcast voice. 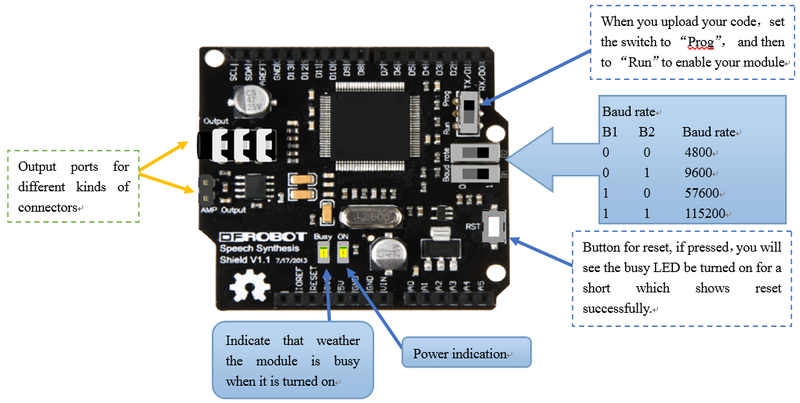 It is using UART communication to make it widely compatible with most controller boards. **Please press RST button on the controller board after uploaded the sketch, or it will affect the normal use. ** **Remember the "RST" button on the speech shield is only the speech synthesis chip. ** The busy led will be light once, when you press "RST". Here is the NEW Speech Synthesis library V2, it fixed some bugs about the number synthesis. A complete command is composed by three sections: Initialization Function, Speech Synthesis Function and Execute Function. It will clear all buffer on your board, and initialize chip setting. For Example： SpeechSynthesis.Espeaking(0,19,4,ssr); //"0" means command (speech synthesis command);"19" means the choice who to speak;"4" means the format of reading;"ssr" store the content. Sample audio of the typical output of this product in English & Chinese. Shopping from Speech Synthesis Shield for Arduino or DFRobot Distributor.